In the speech, Lincoln struck a tone of moderation and reconciliation with the South in restoring the Union. He also hoped that both sides would recognize the importance of equal rights for all Americans. “With malice toward none; with charity for all; with firmness in the right, as God gives us to see the right, let us strive on to finish the work we are in; to bind up the nation’s wounds…to do all which may achieve and cherish a just and a lasting peace, among ourselves, and with all nations” (Abraham Lincoln, “Second Inaugural Address,” March 4, 1865). In February 1869, Congress passed the Fifteenth Amendment, and it was ratified by three-fourths of the states one year later. It stated, “The right of citizens of the United States to vote shall not be denied or abridged by the United States or by any State on account of race, color, or previous condition of servitude.” (The United States Constitution, Fifteenth Amendment, 1869). President Abraham Lincoln and the Republicans in Congress sought to secure an abolition amendment for several reasons. First, they wanted it to be the law of the land in the Constitution Secondly, they knew that Lincoln’s executive authority over slavery would expire at the end of the war. Thirdly, the Emancipation Proclamation would probably face legal challenge in the courts and possibly be overturned. Fourthly, even if the proclamation survived, slavery would be unaffected in the border states of Kentucky, Missouri, and Delaware, not covered in the Emancipation Proclamation. Only a constitutional amendment would decisively end slavery in America, though it would not be easy since amending the Constitution required large majorities in Congress and the states. In April 1864, the Senate passed a constitutional amendment abolishing slavery, but it narrowly failed to achieve the requisite two-thirds majority in the House of Representatives. In June 1864, Lincoln ran for re-election and demanded that the Republican party adopt a resolution for the abolition amendment in its platform. He succeeded, and the platform stated that, “as [slavery] must be, always and everywhere, hostile to the principles of Republican Government, justice and the National safety demand its utter and complete extirpation from the soil of the Republic,” this “gigantic evil” would be forever prohibited in the United States (Republican National Platform, 1864). On January 6, 1865, the House of Representatives took up debate on the amendment, while Lincoln and his Cabinet members traded political favors behind the scenes to secure votes. On January 31, the House narrowly passed the amendment by three votes. The following day, President Lincoln submitted a resolution to the states for ratification. Lincoln’s home state of Illinois ratified that day, and eighteen states ratified the amendment before the month ended. On December 6, 1865, after Lincoln’s death, with the concurrence of several southern states, the amendment was ratified and became the law of the land. The Thirteenth Amendment states: “Neither slavery nor involuntary servitude, except as a punishment for crime whereof the party shall have been duly convicted, shall exist within the United States, or any place subject to their jurisdiction” (The United States Constitution, Thirteenth Amendment, 1865). At the expense of more than 600,000 deaths in a bloody Civil War, the promise of liberty in the Declaration of Independence had finally been achieved for African-Americans. Slavery was expurgated from the country though much work was to be done before African-Americans enjoyed full equality in law and in custom. Abraham Lincoln lived to see General Robert E. Lee’s surrender to General Ulysses S. Grant but would not live to see the ratification of the Thirteenth Amendment. Lincoln was shot by an assassin on April 14, 1865 and died the following day. Among the many consequences of his death was the uncertain outcome of the Reconstruction, as it was called. Lincoln believed that the South had never left the Union and that southerners were rebels or insurrectionists. Therefore, he had favored a moderate plan of reconstruction whereby ten percent of the people of the Confederacy had to sign an oath of allegiance to the Union and the abolition amendment had to be ratified. Contrary to this mild proposal, the “Radical Republicans” in Congress demanded that the South be punished and passed the Wade-Davis Bill in 1864. This plan required an oath of loyalty by a majority of voters in each state, a ban on suffrage or office-holding by high-ranking Confederates, and the abolition of slavery. President Lincoln vetoed the bill. After Lincoln died, President Andrew Johnson supported a more lenient plan than Lincoln’s in which southern states would only have to repudiate the principle of secession and ratify the Thirteenth Amendment. The division between President Johnson and the Radical Republicans in Congress set off a long struggle between the respective branches in government and affected the outcome of the Fourteenth and Fifteenth Amendments as well as the lives of African-Americans. Even as state legislatures were ratifying the Thirteenth Amendment, Southern states were passing “Black Codes,” that severely curtailed freedmen’s civil rights and reduced them to a state closely resembling slavery. In addition, President Johnson challenged the Radical Republicans in Congress over reconstruction and vetoed nearly any bill aiding in the equality of African-Americans or expressing congressional control over reconstruction. The Radical Republicans also believed (against Lincoln) that the southern states had left the Union and could only be readmitted by agreeing to grant African-Americans full civil equality. President Johnson had other ideas and, in February 1866, vetoed the Freedmen’s Bureau Bill, which would have started a federal agency intended to help freed slaves transition to freedom with education and jobs, and then a civil rights bill a month later. Congress overrode both vetoes, but black equality and liberty after the Civil War were lost amidst the constitutional struggle. 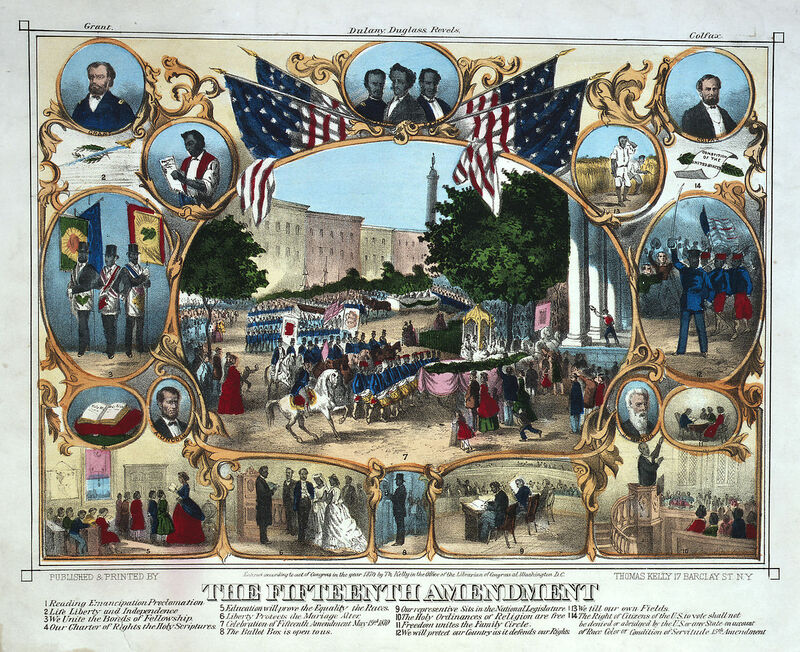 In order to guarantee black civil rights from the recalcitrant states and president, in June 1866, Congress passed the Fourteenth Amendment by a two-thirds majority in both houses and submitted it to the states for ratification without the courtesy of notifying President Johnson. In March 1867, Congress took even harsher steps to punish the South and enacted the Reconstruction Act, which divided the region into five military districts. The states would be readmitted into the Union when they ratified the Fourteenth Amendment and protected the rights of African-Americans. President Johnson vetoed the bill, but Congress overrode the veto. In March, Congress also passed the Tenure of Office Act, which prevented President Johnson from circumventing the Reconstruction Act by removing officials governing the military districts. The president vetoed the measure, and Congress overrode the veto, but this was the last straw for Congress. The Radicals started to explore impeachment proceedings in the House Judiciary Committee. Article II, Section 4 of the Constitution states, “The President, Vice President and all civil officers of the United States, shall be removed from office on impeachment for, and conviction of, treason, bribery, or other high crimes and misdemeanors” (The United States Constitution, Article I, Section 4, 1787). The rationale for impeaching Johnson for misusing the presidential veto was weak because the evidence for high crimes did not exist. As a result, the impeachment attempt was not succeeding. In the summer of 1867, Johnson sought to remove Secretary of War Edwin Stanton from office, and Congress moved to impeach the president. On February 21, 1868, President Johnson officially removed Stanton from office. Two days later, the House voted to impeach Johnson by a vote of 128 to 47. In order to be constitutionally removed from office, the Senate would have to hold a trial against the president presided over by the Chief Justice of the Supreme Court according to Article I, Section 3 of the Constitution. “The Senate shall have the sole power to try all impeachments. When sitting for that purpose, they shall be on oath or affirmation. When the President of the United States is tried, the Chief Justice shall preside: And no person shall be convicted without the concurrence of two thirds of the members present” (The United States Constitution, Article I, Section 3, 1787). When the vote was taken, moderate Republicans broke ranks because of the weakness of the argument and evidence, and Johnson kept his office by a single vote. Former Union general Ulysses S. Grant was elected president months later. In July 1868, the Fourteenth Amendment was ratified by three-fourths of the states. It provided national citizenship, the protection of privileges and immunities within the states, a due process clause, and equal protection of the laws. Section 1 read: “All persons born or naturalized in the United States, and subject to the jurisdiction thereof, are citizens of the United States and of the State wherein they reside. No State shall make or enforce any law which shall abridge the privileges or immunities of citizens of the United States; nor shall any State deprive any person of life, liberty, or property, without due process of law; nor deny to any person within its jurisdiction the equal protection of the laws” (The United States Constitution, Fourteenth Amendment, Section 1, 1866). In February 1869, Congress passed the Fifteenth Amendment, and it was ratified by three-fourths of the states one year later. It stated, “The right of citizens of the United States to vote shall not be denied or abridged by the United States or by any State on account of race, color, or previous condition of servitude” (The United States Constitution, Fifteenth Amendment, 1869). 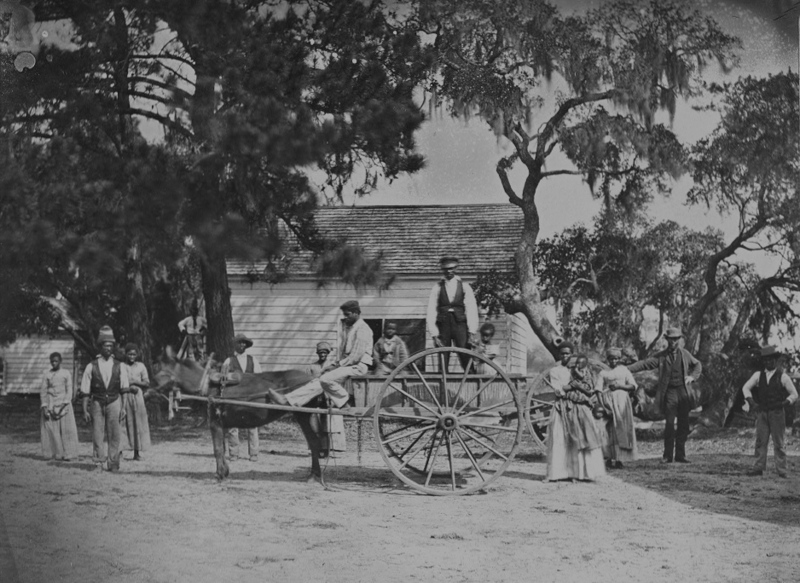 Although African-Americans soon made up the majority of voters in some southern states and even elected some black representatives to Congress, the right to vote was curtailed by southern states through several legal devices including poll taxes, literacy tests, and grandfather clauses, as well as by plain intimidation of blacks attempting to vote. Paying taxes or passing a reading test to vote hurt poor, illiterate whites (though it was not always administered against them) as well as blacks. The grandfather clause hurt only African-Americans and banned anyone from voting whose grandfather had been a slave, which effectively banned most freed men from voting. “All persons born or naturalized in the United States, and subject to the jurisdiction thereof, are citizens of the United States and of the State wherein they reside. No State shall make or enforce any law which shall abridge the privileges or immunities of citizens of the United States; nor shall any State deprive any person of life, liberty, or property, without due process of law; nor deny to any person within its jurisdiction the equal protection of the laws” (The United States Constitution, Fourteenth Amendment, Section 1, 1866). Despite the great successes of the Civil War Amendments in winning liberty and equality for African-Americans, they found themselves suffering many restrictions of their rights in the decades after the Civil War. They lived in perpetual debt with sharecropper farming, violence by groups like the Ku Klux Klan, voting restrictions, and even legal segregation (separation of the races) in Jim Crow laws and the infamous Plessy v. Ferguson (1896) Supreme Court decision which ruled in favor of the constitutionality of those statutes of inequality. Separate was held to be acceptable if the institutions were equal, though they relegated African-Americans to an inferior status. In the original debate over the Constitution, James Madison feared that the greatest threat to liberty in a republic came from popular majorities. “Wherever the real power in a Government lies, there is the danger of oppression,” Madison wrote, “In our Governments the real power lies in the majority of the Community, and the invasion of private rights is chiefly to be apprehended…from acts in which the Government is the mere instrument of the major number of the constituents” (James Madison to Thomas Jefferson, October 17, 1788). He also feared popular passions in a republic. African-Americans in the post-Civil War-South discovered first-hand the dangers of majority tyranny in a republic whatever constitutional protections they had won. It would be almost a century until the Civil Rights Act of 1964 arguments for liberty and equality for African-Americans would win acceptance as, in Madison’s words, “fundamental maxims of free government” (James Madison to Thomas Jefferson, October 17, 1788).